This site aims to document and tell a story of many things, not least the power of travel and Couchsurfing and it’s ability to introduce one to parts of the world they would never have known existed and people they would never have met otherwise. Up until now, the majority of hosts throughout my journeys have been people that I myself had hosted in Australia. People that, while they may have only stayed with me for a few days, I managed to become pretty close to. You see, there’s a certain extra level of connection when you temporarily live with somebody else, share a kitchen, living room, bathroom and meals as opposed to when you might meet the same person for a few drinks and dinner once or twice. Depending on how long your/their stay is, you get to see them during their good times and likely also during some down times. And they get to see you during both extremes too. Perhaps it was just a tough day at the office and one comes home more frustrated or tired than usual, or they had just separated with their ex-partner. Or perhaps they had just won a sports final or met somebody new. The point is, you get to see these people in all sorts of situations and in a large part of the mood spectrum. This enables you to share a heightened understanding of one another and this extra level of connection that I mentioned. And even when you/they leave, you’re likely to remain in touch, particularly with those that you bonded with closely, and this brings an even greater connection. Then there are the new experience Couchsurfers that I have stayed with. New experience, not because it may be their first time using the system, but because it’s our first time getting to know each other. For these, the connection is not as strong, but the excitement of discovery is there for these, and the chance to form a new bond. And there’s yet a third relationship here. One that I haven’t yet really been involved with throughout my travels. That is meeting someone during your travels and then Couchsurfing with them later on in the same series of travels. You haven’t met them as a result of Couchsurfing, you just happened to both be tourists at the same time. Surprisingly, this kind of connection has been rare during my travels. I don’t think it’s on account of being unsocial, more so that I’ve tended to stay away from extremely touristic ventures and have therefore steered clear of other tourists. Even my Couchsurfing experiences have generally been with myself as the sole surfer, and so I haven’t been able to meet any other travellers Couchsurfing with me at the same time, with a few notable exceptions. Would this third kind of connection be any different to the first two? It’s something I was to find out for myself during my stay in Belfast. The keen Couch to Couch follower may remember that during my time in Lyon, Joss and I met a couple of Irish girls – Danielle and Sarah. After sharing a day out in Lyon with them, they told me to get in touch if I ever came to Belfast. So I did just that and got in touch with them. Sarah was to be out of town during my intended time of stay, but Danielle kept her word and was very welcoming in agreeing to put me up for a few days. Truth be told, had I not have had met Danielle and Sarah in Lyon, I probably wouldn’t have even thought of visiting Belfast during this UK trip and would have saved it for a later date when I plan to revisit the rest of Ireland. 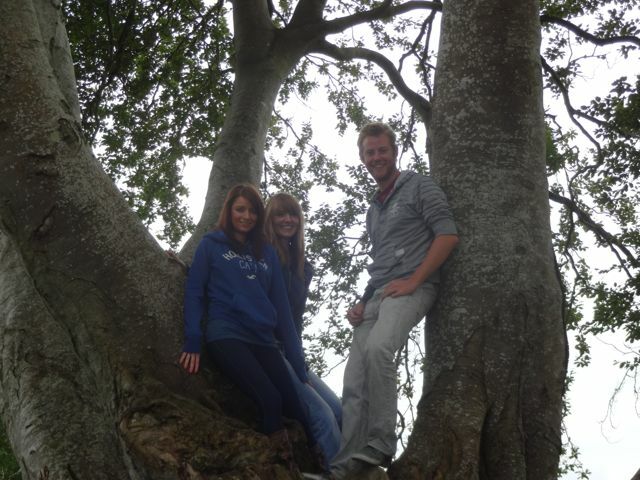 Being able to catch up with the girls (well, Danielle at least) was a big part of the reason I even went to Belfast. There were a few other reasons too, however. Belfast, as I had explained in my previous article, held some intrigue for me and – again for the keen reader – my long time Australian friend Steve, who I had met previously in London, was also going to be in Belfast the same dates. It was meant to be. Danielle welcomed me by picking me up at the airport and greeted me with a smile on her face. It was incredible to think that it was “only” six or so weeks earlier that we had met in Lyon, yet so much had happened since. She lived in a cosy part of town – walking distance from the city – in a nice apartment upstairs. She even had a spare bedroom with a super comfortable bed for me to sleep in and although her couch would have been just as comfortable for me to have slept on, I was very appreciative. On the first night, Danielle cooked dinner for me and offered me a few drinks. All the things I should have really been doing for her, I said. This was nonsense to her, as I was her guest, but I still felt kind of bad for not having arrived with anything to offer. At first I thought that Danielle didn’t really get the concept of Couchsurfing – of how I was in her debt and this was all happening the wrong way around. But then I quickly realised, there is no right way of Couchsurfing, and she was merely displaying the local Irish tremendous hospitality and friendliness to me and was therefore, even though it was her first time Couchsurfing, doing it just as perfectly as anybody else. I also met her sister Ciara, who was just as friendly and welcoming and the two were able to provide me with some great tips on what to do and visit whilst in Belfast. In fact, on the first night, we tried to visit the Belfast Castle together, only to find that it was past closing hours. So instead they took me on a driving tour around town – through the University district and the city. On a later day we ended up visiting the Belfast Castle during the day while it was open and enjoyed attempting to find the hidden cats within its gardens. I also visited a couple of churches with the two sisters and caught a glimpse of some of the murals about town. I found some time to catch up with Steve for a couple of nights and, with the advice of Danielle and Ciara, visited a few of the bars around town. It’s of perhaps no surprise that there were plenty of bars to choose from and also a great variety of bars in Belfast. The nightlife was teeming here on a weekend and each of the bars we visited were active enough, without being overly crowded. Some were more relaxed, some were louder than others and some displayed the famous live Irish music scene. One in particular, of which I forget the name, I was very impressed with. A large establishment, one entered to the front bar which appeared not too untypical for a pub in this part of the world. Here it was dark, crowded and a stage played host to a band playing music. But as you continued to venture through the place, you exited behind to a large outdoor setting which acted as an enclosed courtyard. Surrounding this were various seated areas and other bars, each with their own theme. One was more of a country pub style area, with wooden benches and a small bar. Upstairs from this was an open area decorated to look like the interior of an old 1950’s household with couches, chairs, coffee tables and cushions to match. Across the other side of the courtyard was a cocktail bar more suited to a club-like atmosphere. Within this one establishment lay four or five different bars, each with their own mood and environment attached to it. This place had something for everybody. Steve and I met all sorts of locals during our adventures out in town. There was a female firefighter from Canada who was in town for the World Firefighter Games (of which I had no idea existed), some young Irish girls that were very keen to tell a couple of Australians about the case to join the republic and some not so young Irish women that we had a great laugh with. Of particular note was one older bloke who invited himself to our table whilst we were talking with the Canadian. He was friendly at first, but became a bit annoying with time and would tell stories of dangerous friends and threatened us to pay respect to him. A few too many drinks for this bloke and our patience with him ended when he declared a toast to his dead father an hour or so into our talks. Overall, the locals here were very friendly and outgoing and it’s incredibly easy to meet people out and about in Belfast. Back home with Danielle and she was determined to use my visit as an opportunity to discover a little bit more of her home region herself. We looked into the possibility of visiting the famous Giant’s Causeway but some digging around on the Internet made us realise that the cost was far too high to visit. For me, the fact that there was any associated cost at all was sickening. I can understand that, for a visit to La Sagrada Família or to travel atop the Eiffel Tower, there is a cost involved. These are man-made structures that cost money not only to erect but to maintain also, so if people want to continue marvelling at their magnificence they should not be too fussed to pay a fee in order to keep it standing for other people to see (the magnitude of this fee is another debate altogether). But for a natural wonder, built up over thousands of years of natural processes, to be exploited and have a pricetag put on its head for the people who inhabit its land is disgusting. Not even a born-and-bred Irishman can visit part of his/her own country to appreciate it more without shelling out. There is no maintenance involved – and any maintenance there may be would indicate interference with the natural processes that created this marvel in the first place. The costs, therefore, are merely a money-grab by the National Trust. 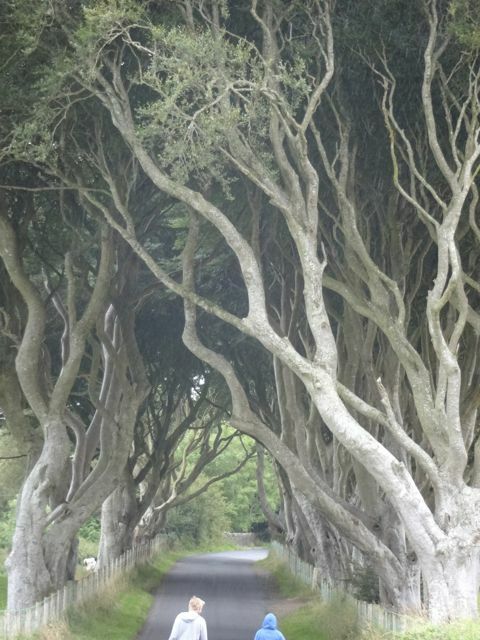 Because of this, we decided to turn our interests elsewhere, and ended up settling on a small, little known area called The Dark Hedges, in the countryside north of Belfast. A typically dreary, wet, Irish day didn’t dampen our spirits as we set out on our adventure. We knew roughly where to head, but not precise directions. The attraction was a little underground. It seemed it’s only just beginning to become an actual touristic venture and as a result there are no signs pointing to the site. We navigated our way to the small town of Ballymoney before stopping into the tourist information centre to ask for directions. The Dark Hedges had obviously had some pull around the area as they were well prepared and had pre-printed (albeit somewhat amateurish) maps with directions to the location. Another ten or so minute drive and we had arrived. In essence The Dark Hedges is just a road like any other northern Irish countryside road winding through the green fields. But this one had a distinct difference. It’s shrouded by large, overflowing Beech trees that perfectly arch out above the road and interweave with the adjacent tree on the opposite side of the road. It produces a kind of canopy the protects the road underneath. The series of trees extends for some hundreds of metres, each close enough to the last that it almost creates a tunnel of foliage. It was certainly a picturesque setting and with little to no civilisation nearby the rolling winds through the trees’ branches and rustling leaves were the only sounds to be heard and it certainly provided a very peaceful, cleansing experience, even if it was a bit cold for comfort. 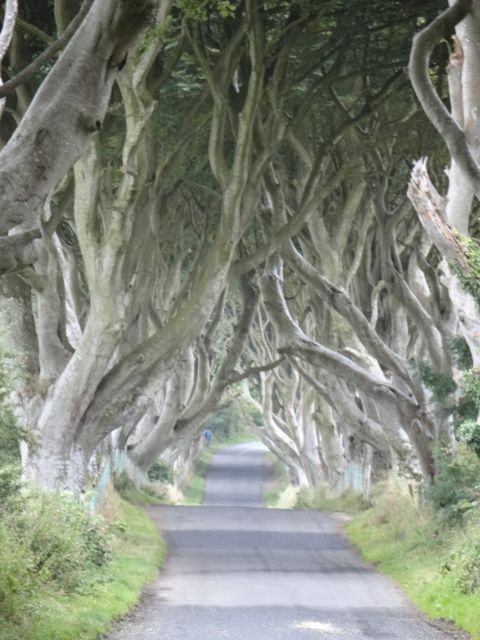 When we first arrived we were the only people on the road and so I got the impression that The Dark Hedges were just a passing fancy a few people had the pleasure of experiencing each month. Not long after, though, and another car had pulled up also looking to enjoy the view. Before too long there were about five or six car loads of people taking photographs of the road – each one looking for that perfect shot. The problem was, the perfect shot was the one of the entire stretch of road, at peace with itself, untouched and with no soul in the frame. This was simply not possible though as the people here had dispersed themselves along the road to produce an almost impossible setting for taking a photograph with no people in it. I had a crack at it though. 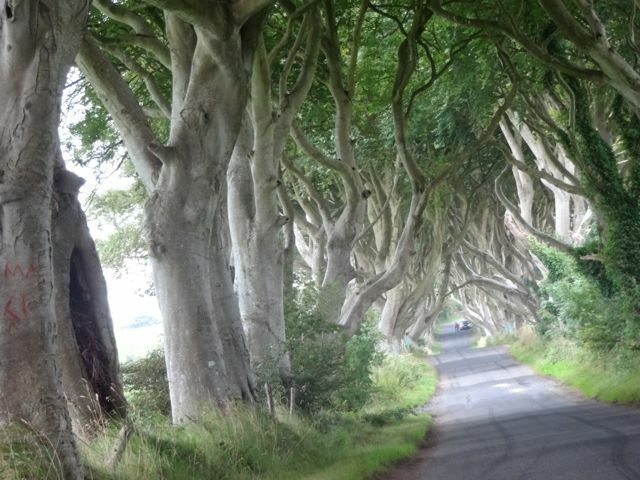 The Dark Hedges are one of those surprising tourist attractions in that it really shouldn’t be a tourist attraction at all. As beautiful as it was with its distinct trees on either side, I remember being in the moment and thinking it wasn’t any more special that the kind of relaxing beauty I could likely appreciate if I went four kilometres east to the next countryside road. Yes, this road was different, but why should it be appreciated more than the remainder of the northern Irish countryside? Of all the things I had actively pursued during my travels, this would have had to have been one of the least extraordinary, I thought to myself. That’s not to say that I didn’t enjoy the moment, but to call it a tourist attraction didn’t feel warranted. And here comes the most surprising part. Now, almost a year later, it’s one of the most memorable parts of my trip. I recall it vividly, every little detail. The feel of the cold breeze on my skin as it passed through my clothing, the smell of the fresh country air, the sound of the cars from afar as they approached. And I love it. I love taking myself back to that place. In that cold, uncomfortable breeze, wishing the other pesky tourists would get out of my desired photo frame. The Dark Hedges, remarkably, turns out to have been more impressionable on me than many of the other things that I have done on my journeys. One shouldn’t underestimate the power of even the most simplest of things to provide fantastic memories. Soak up the environment you are in, even if you don’t think too much of it in that moment. Danielle, Ciara and I still had a few hours of daylight left so we decided to pass through nearby Ballycastle, a seaside town on the northern coast of Ireland. 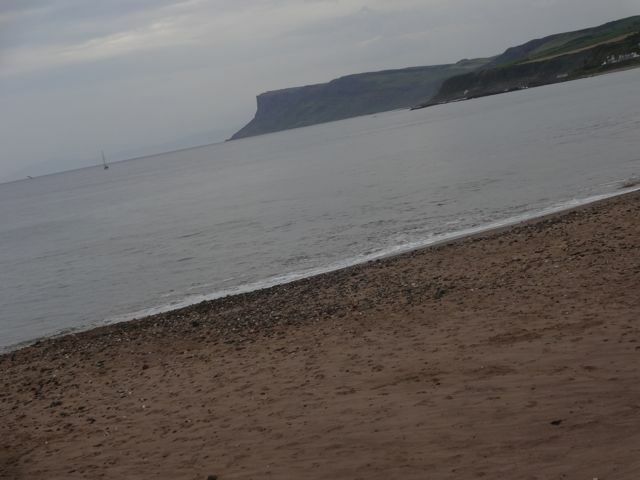 We visited the beach of Ballycastle which, while Danielle and Ciara seemed impressed by it, was not really up to scratch with my Australian and Spanish standards. Nonetheless we took some time to walk along and appreciate it. No more than fifty kilometres on the other side of the sea stood Scotland, and it was a stark reminder of the relative proximity of countries and cultures in this incredible continent. 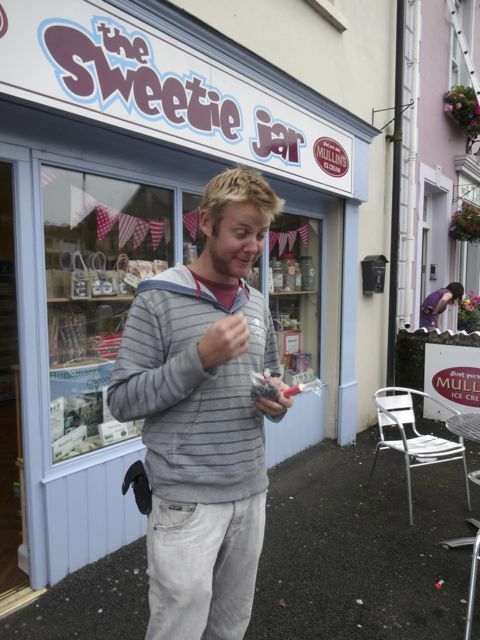 The trip ended with a visit to a local candy shop where we purchased some salted seaweed treat, apparently a favourite of Ciaras. It only took a few bites for me to make my judgement and decide not to finish the bag, although Ciara tried assuring me that this particular batch was not of the highest quality. Of that, I was certain. And that capped off a remarkably fun stay in Belfast. Danielle and I didn’t have as much to catch up on as I would have with Couchsurfers that I had hosted in the past, nor did we have the excitement of discovering each other as much as I would have with somebody completely new. Yet we still managed to share in a lot of fun and to learn more about each other, and share together the discovery of The Dark Hedges. That, after all, is Couchsurfing in it’s purest form – sharing experiences with others. How you meet those other people has no bearing on the quality of experiences that you can have together and Danielle is proof of that.